This is my second look styling my white jeans for fall! (If you need a refresher on the first way I styled them, take a look back here). This outfit is definitely on the casual (and even hipster) side, but it's great to throw on on the weekend or to run errands. Do you have any fun weekend plans?? I definitely thought yesterday was Thursday, so naturally it's pretty disappointing that today is not in fact Friday haha. This weekend I plan to do a little bit of shopping and a lot of relaxing. I. Cannot. Wait. PS ~ Don't forget to enter my Anjolee Jewelry Giveaway for the chance to win a gorgeous eternity band ring! Too funny–I wore this SAME outfit the other day with that shirt and white cords. You look so pretty! Another great and stylish way to wear white jeans, i think most of us own a denim shirt so it would be the ideal and most versatile pairing. Casual, but still adorable! I absolutely love this button down. 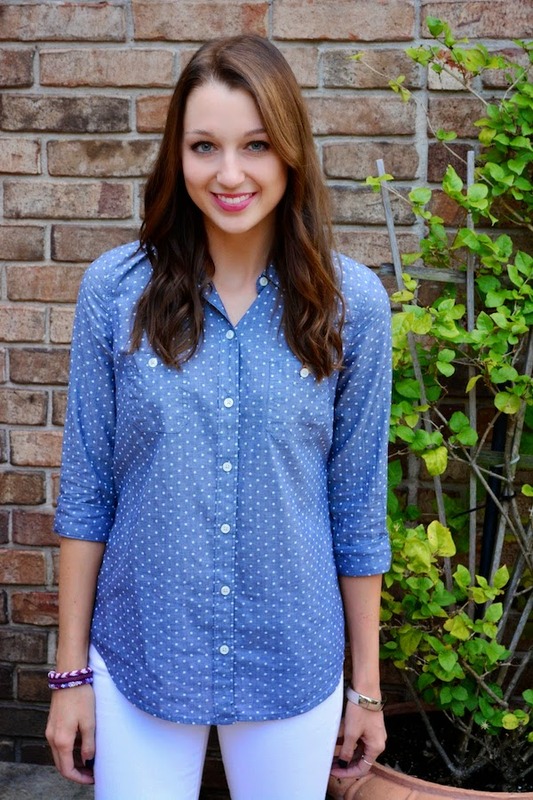 It's reminding me that I don't have a chambray polka dot button down in my life yet, and that needs to change. Great look! Denim is always a go to look. Maybe I will try it with white jeans and boots! classic look, you look gorgeous. Really cute shirt! Love this outfit! Just found your blog and really like your look! Would you like to follow each other on GFC and Bloglovin? Let me know! Love this looks! Simple and cute! Funny how white jeans are now a staple for fall. And LOVE those booties. I like this minimal look! love this simple fresh look :) white jeans are so versatile! Oh, great to hear! I wasn't sure if it was or not since I haven't been to the mall in awhile :) But how neat that you own it too! I love it. I LOVE this outfit! The chambray with the white jeans and wedge bootie? Fabulous! !